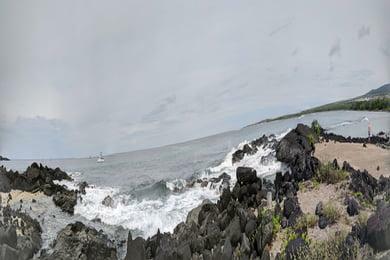 You'll find this lovely little beach sandwiched in between Kona and the Kona Airport on the west side of the island. The west side of The Big Island is flush with white sand beaches despite its fields of black volcanic rock. And this particular beach is perfect for the history lover. Ai'opio Beach is part of the larger Kaloko-Honokohau National Historic Park which is dripping with history. Here, you can view archaeological sites that give you insight into the lives of ancient Hawaiians long before Captain Cook or any other Westerner stepped foot on the islands. And you can find this historic park just north of Honokohau Harbor. One of the most interesting features of the park is the Ai'opio Fish Ponds. These “ponds” were a way for ancient Hawaiians to catch fish. The fish would swim into the harbor, explore the dug out ponds and then be trapped for an easy catch. And the fish ponds are very close to the beach, so, if you find the fish ponds, then you've found Ai'opio Beach. 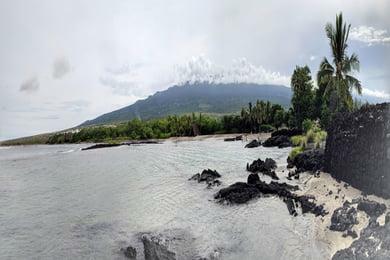 The beach itself is a small strip of sand surrounded by volcanic rocks, so you'll want to pack your water shoes in order to protect your feet. But the sharp volcanic rocks come with a massive benefit -- sea turtles. These friendly sea creatures love to feast upon the vegetation growing on the rocks. Remember that it is illegal to touch green sea turtles in Hawaii, and authorities enforce this regulation vigorously. The oils in your skin can also degrade the sea turtle's shell which can reduce the turtle's life expectancy. The oils can stay on the shell for quite a while, and these sea creatures live to about 80, so keep your distance to snap that selfie. The water here is usually calm as the beach is protected by an off-shore reef. The reef and the sea turtles make Ai'opio Beach perfect for an unforgettable snorkel. So, pack your snorkel gear, head down to the historic park to learn about ancient Hawaiian life, marvel at the ingenuity of the fish ponds and then swim with sea turtles for an incredible day on The Big Island.